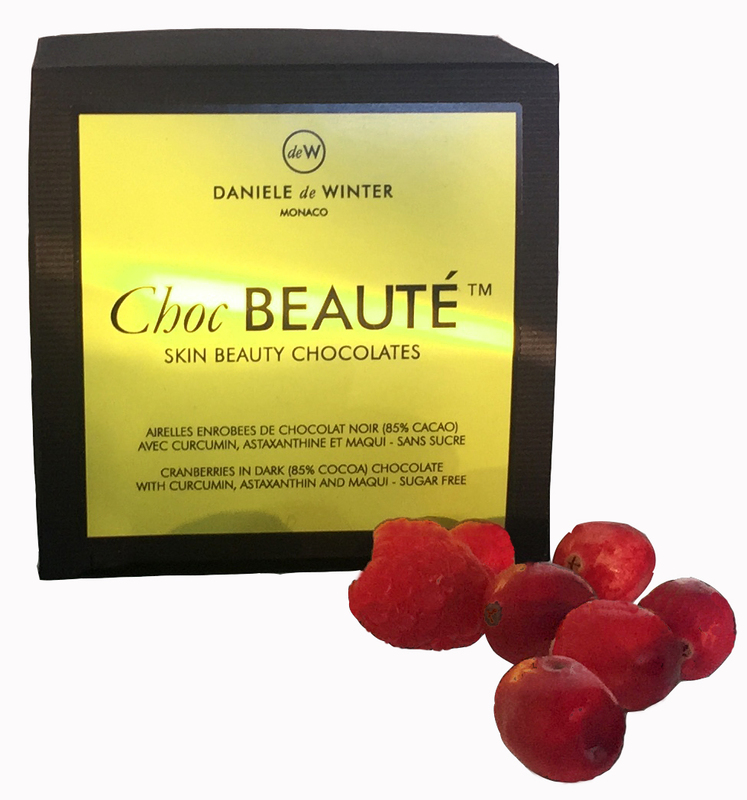 Recognized as a source of powerful anti-aging antioxidants, ChocBEAUTE are sugar-free, 85% cocoa, chocolate covered cranberries formulated with some of the most exciting super-fruits in nature to improve skin tone and radiance, protect against free-radical damage and smooth your complexion. Revered for thousands of years.. Dark chocolate has been cherished for its life-enhancing properties for over two thousand years. Back in the time of the ancient Mayan and Aztec civilizations, cocoa was revered for its ability to boost virility. Since then, scientific studies have confirmed dark chocolate's to lower blood pressure, enhance cognitive performance and illuminate the complexion. ChocBEAUTE are made from highest quality, sugar-free 85% cocoa chocolate sweetened with Maltitol, a natural sugar alcohol, blended with extremely powerful natural antioxidants. These include Polyphenols and Catechins from Maqui, Raspberry, Blueberry, Matcha Green Tea and Acai, Carotenoids from African Mango, Cranberry, Baobab and Acerola as well as Astaxanthin from red algae. This powerful blend actively protects skin cells from free radical damage and provides a delicious way to enhance the beauty of your complexion. ChocBEAUTÉ blends these powerful, broad-spectrum antioxidants with highly bioavailable Marine Collagen and special Glucosamines. Numerous studies have demonstrated that combining natural antioxidants with bioavailable marine collagen leads to higher levels of collagen synthesis and enhanced production of hyaluronic acid. The added presence of the special Glucosamines identified by DANIELE de WINTER has been shown in CLINICAL studies to further increase collagen synthesis by a staggering 33%. One of the most exciting benefits of ChocBEAUTÉ is that its powerful blend of antioxidants actively delays entry of sugar from food into the bloodstream. Antioxidants such as Astaxanthin and Curcumin block the action of a digestive enzyme called alpha-glucosidase which releases sugar from food into our blood. This means that eating ChocBEAUTE does not cause any spike in insulin levels but instead leads to a much gentler and steadier rise in blood sugar. ChocBEAUTÉ are presented in chic boxes of 50g or 200g. Recommended intake : 4 to 7 ChocBEAUTÉ a day.